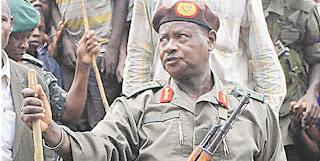 The picture of President Yoweri Museveni arriving in the Eastern district of Bududa to view the damage caused by the landslides last week donning a full military uniform, an AK-47 assault rifle strapped over his shoulder has attracted a lot of debate both in the media and blogsphere. Some commentators who are cynical have even gone ahead to ask which war the President was fighting. In addition some have wondered whether his show off did not scare the already traumatised people. Why he had to fly to Bududa in military uniform despite all the security detail at his disposal will always remain a matter of debate and speculation but one thing that can’t be doubted is how the President has succeeded and continues to use the military to institute fear amongst Ugandans upon which he has been able to rule for quarter a decade now without much challenge. In this regard, some people have already linked the recent elevation of the first son in the army as another scheme by president Museveni to have his son succeed him through the army. Since 2000 Muhoozi, 35, has attended high profile military courses in America and the United Kingdom and quickly climbed the ranks although records of him as a distinguished soldier are hard to come by. This also reminded me of the year 2000, in the face of an impending court martial for authoring a document that critiqued the movement; the retired Col. Dr. Kiiza Besigye announced his candidature to challenge president Museveni in the 2001 elections. This inevitably caused excitement all over based on the hope that President Museveni’s militaristic bullying could now be answered back in the same currency by a fellow soldier. Dr Besigye did not disappoint either. During the campaign trail, he re-assured the supporters that he’s the only solution to vote rigging. “Just cast the vote in my favour and leave the rest to me” he asserted. The rest is now history. The above scenarios clearly show how the ruling NRM and the main opposition party FDC believe in applying a militarist approach to solving Uganda’s political problems which I think is dangerous. Much as the military have a role to play in protecting the country’s boundaries and protecting the will of the people, it should never interfere in politics as it has always been since 1966. Surely, the military contribution to politics is not useful politically because their mind is not political and they are in most cases not open to dialogue. Militarism is synonymous with use of force and violence. Uganda is still one of the few countries that have never witnessed a peaceful handover of power. This has been largely attributed to the act of entrenching militarism in our politics right from Obote 1. But the aspect of militarism that has been entrenched in the minds of Ugandans to the extent of losing hope and coming believe that Uganda can only be ruled by a military man or someone with a background in the military is most worrying. This repugnant thinking has not spared many senior government officials who are secretly encouraging their children to join the army as a way of grooming them to be future Ugandan leaders. This is absurd. To make matters worse, the main opposition party FDC which is supposed to provide alternative policies and view points is practically reinforcing this dangerous attitude by making the top leadership position in the party a preserve of people with a military background. Is it by coincidence that, on two occasions now, it is Major General Mugisha Muntu squaring off with Col. Kiiza Besigye for the party’s top most position? What happened sometime back, when the eloquent Aswa County MP, Reagan expressed interest in the same position? Dr. Besigye was quick to dismiss him as unfit despite his experience in parliament since 1996. Asked who he thought would suit in his shoes, Besigye suggested Col. Nuwe Amanya Mushega , another soldier who had by then even not publicly associated himself FDC . This speaks volumes about the FDC’s agenda to continue entrenching militarism in our politics despite strides made by other developing countries to overcome it. But one wonders whether Uganda or any other country for that matter needs a leader with a military background. Should people who aspire to be leaders attend military academies as a pre-condition? How has Dr. Kiiza Besigye’s militaristic skills been of value to Ugandans his involvement in elective politics 10 years ago? When his votes were rigged in 2001 and 2006, despite his claim that he enjoyed over 90% support in the army, Dr. Besigye did not fight as expected but Instead, he went to the court just like the Semwogereres would do. Surely, did we need a soldier to do that? The leader of the world’s most powerful nation, America, which also doubles as the oldest democracy did not attend any military academy; neither did the leader of the largest democracy India or any other of the developed world. Once can say that is the West, but what about Africa? Nigeria which was under military dictatorship for close to 30 years provides the best example. Despite the fact that the military also doubled as the most highly educated personnel, eventually the power of reason prevailed and they handed over the power to civilians when General AbduSalaam Abubaker saw light and decided to hand over power to the civilian government immediately after Abacha’s demise. Since then Nigeria has moved on to full brown civilian rule. Ghana, which is now the icon of democracy in Africa, has also undergone the same experience with General Jerry Rawlings ruling for up to 20 years but eventually hands over power to civilians and the country has never looked back since then.